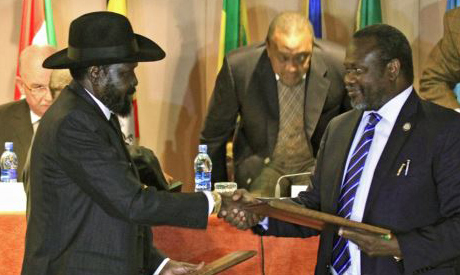 On 26 August, 2015, South Sudan’s President, Salva Kiir signed a peace agreement in Juba with rebel leader Riek Machar. Machar, who was the former vice president of South Sudan, broke off in December 2013 sparking a civil war that has ripped apart the newest country in the world. Although Machar had already signed the agreement in Addis Ababa on 17 August, Kiir had called for a two-week extension for further consultations. Notably, President Kiir entered a significant number of reservations upon signing the agreement in Juba on August 26th. These reservations were annexed to the agreement in a twelve-page document. President Kiir’s reservations relate to fundamental aspects of the peace agreement, most importantly the status of South Sudan’s army; the demilitarisation of the capital, Juba; the opposition’s role in establishing the national unity government; in addition to the wide mandate of the Joint Monitoring and Evaluation Commission. South Sudan’s government perceived these provisions as encroaching on its sovereign powers. It is no secret that President Kiir was subjected to a huge amount of pressure to sign the agreement, including a direct threat to impose sanctions against South Sudan through a UN Security Council Resolution. Ultimately, he agreed to sign, with the understanding that his reservations will be taken into serious consideration. From the onset of the bloody conflict in South Sudan, Egypt’s position has been to consistently emphasise the need for a peaceful resolution of the conflict. Egypt has therefore supported IGAD’s efforts as well as other parallel endeavours such as the Arusha process brokered by Tanzania. It is therefore natural that Egypt has welcomed the conclusion of this peace agreement after months of negotiations. Simultaneously, Egypt seems to be cautiously optimistic. Significant reservations were articulated by President Salva Kiir and he obtained pledges that these reservations will be seriously considered with a view to implementing the peace agreement. However, in the West, reports have surfaced of a rejection of Kiir’s reservations. The US government stated “we do not recognize any separate reservations made about the agreement and expect all parties to abide by all elements of the final peace agreement”. In addition, the international partners (witnesses to the agreement) refused to sign the annex containing South Sudan’s reservations. How is it possible, in light of this acute difference in views, to guarantee the implementation and sustainability of the peace agreement? How can we expect a power-sharing arrangement to succeed if one of the parties was forced to sign under extreme pressure and still has serious reservations which remain unaddressed? How can we avoid the power struggle that has characterised South Sudan’s political scene since 2013 and the ensuing humanitarian crisis that has engulfed South Sudan? It is the responsibility of the international community, including the IGAD and the African Union (AU) to maintain the balance between the negotiating parties and to place equal pressure on them to implement the peace agreement. Some foresight is necessary in order to guarantee the agreement’s sustainability in the long run. Numerous agreements have been signed between the government of South Sudan and the rebels, but have failed to be implemented. Ultimately, the real victims of this ongoing power struggle are the ordinary citizens of South Sudan. Since the fighting began, thousands, if not tens of thousands have been killed and hundreds of thousands displaced. Currently the spectre of famine is looming over South Sudan, threatening the lives of many innocent civilians. This makes it all the more urgent for the international community to act with wisdom and make sure the peace agreement is not only implemented in the short-run, but capable of establishing a long-term and sustainable peace. *The author of this blog post is the Advisor to the Former President of Egypt. If u want to eat a big cake u have first to cut it down into pieces. Guess that what some powers is doing in some african & ME countries by reshaping their borders. Divide and conquer strategy. Its noticeable that this occurs in Egypt’s NS backyard like Sudan & south Sudan. Opening continuous communication channels is a one solutions yet definitely other solutions will be created by egypt’s DM.